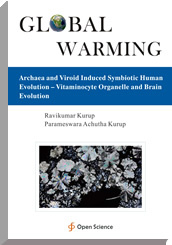 Global warming leads to endosymbiotic archaeal growth and generation of new cellular organelle called the vitaminocyte. The vitaminocyte synthesizes ascorbic acid, ubiquinone and alpha tocopherol which can regulate mitochondrial function and free radical metabolism. This can contribute to the genesis of human disease. Experts in Neurology, Psychiatry, Biochemistry, Molecular Biology, Cell Biology, Evolutionary Biology, Anthropology, Internal Medicine, Climatology.